At an elevation of 3542 feet above sea level, Lake Glenville is the highest lake east of the Mississippi. This spellbinding mountain lake is 4.5 miles long with 26 miles of shoreline, covers 1470 acres, and has a maximum depth of 125 feet. Hurricane, Norton, Mill, Cedar and Pine Creeks feed the lake; these are the headwaters of the west fork of the Tuckasegee River. The Lake Glenville community, which covers a large area of shoreline and surrounding mountainsides, is a fascinating example of how hydroelectric development can interact with nature to create and maintain a truly idyllic place. The Lake was created as part of the Thorpe Hydroelectric Project, originally built to supply power to produce aluminum for the manufacture of B-17 Flying Fortress Bombers during World War II. The project brought electricity to a large swath of the Blue Ridge Mountains that had previously lacked it. The Thorpe hydroelectric plant downhill on Highway 107, now owned by Duke Energy but still housed in its original stately Gothic Revival brick powerhouse, produces enough electricity each year to supply about 12,500 homes. Thorpe is Duke Energy’s most efficient hydroelectric project, thanks to the 1169-foot drop in elevation between the water intake and the water turbine that generates electricity. This vertical drop, or "head,” is the highest of any American hydroelectric development east of the Rockies. After fifty years, the earth and rock dam, the tunnels, and the machinery remain in excellent condition, thanks to regular maintenance and inspections. The historic powerhouse, with its massive arched windows and cross-motif masonry, looks especially haunting at dusk or at night, when it seems to glow from within in its steep valley setting. Driving up or down the mountain on scenic Highway 107, motorists’ first encounter with the sparkling lake and its surrounding vistas can leave them breathless. From the lake, one can enjoy views of Whiteside, Shortoff and Yellow Mountains. This is a particularly spectacular place for leaf-peeping in autumn. The Glenville community is also famous for its Christmas tree farms, which provide Fraser firs to much of the Southeast every December. Starting around Thanksgiving, huge flatbed tractor-trailers haul hundreds of trees at a time down the mountain. Driving the byways and back roads around the lake, one is struck by the vast acreages of firs on mountainsides, punctuated by hardwood forests and rustic homesteads. Numerous islands dot the lake; these were once mountaintops that rose from the valley before 1941, when engineers finished building the dam at present-day Pine Creek Road and filled the lake. The historic buildings along the lakeshore, like Hamburg Baptist Church, were actually relocated to their present locations before the lake was filled; their original locations are underwater today. Beyond the production of electricity, another important benefit of the Thorpe hydro project has been the flood control provided by the dam at Pine Creek, which, because of its earth and rock construction, is 830 feet thick at the base. The safety "fuse plugs” built into the dam spillway entrance were the first ever used at a hydro development. The earthen fuse plugs protect the dam and life and property downstream in event of extraordinary high floods. The lake has proven a popular spot for outdoor activities such as fishing, boating, camping and picnicking since the 1940s. This is a prime destination for fishing. The lake itself offers a bounty of trout, walleye and bass, and the streams feeding it, as well as the Tuckasegee River below the dam, are among the top fly-fishing locations in the East. In 1974, Nantahala Electric (owner of the lake and its hydroelectric facility before Duke Energy purchased both) donated 79 acres on the shore of the reservoir to Jackson County for a park. Known as Andrews Park, it provides a picnic shelter, camping facilities and a boat ramp for public use. Recreational water sports such as canoeing and rafting have also been enhanced downstream in the Tuckaseegee River by virtue of the hydroelectric project. Six times a year, Duke Energy releases water into the Tuckasegee Gorge for recreational use by whitewater kayakers and rafters. The schedule for the releases can be found on Duke Energy’s website [link] or through the Friends of Lake Glenville (FLG) [link]. 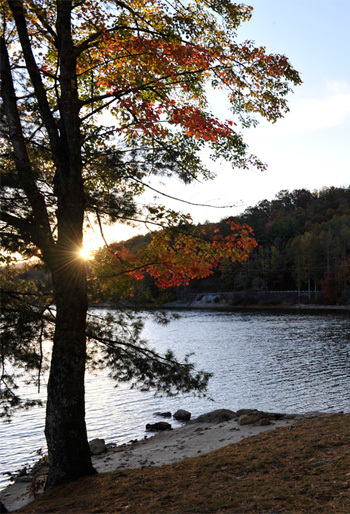 Recently, the FLG successfully lobbied Duke Energy to allow the creation of a public swimming area on Lake Glenville, and work will begin on building the swimming beach in November 2013. The FLG is an association of lake residents—both owners of shoreline property and registered voters in the township—chartered in 1988. Preserving the lake’s water quality and protecting lake ecology are the FLG’s top priorities. It has instituted a sophisticated water-quality monitoring system, collecting samples from several parts of the lake and from tributaries feeding the lake, and sending them to a certified lab at UNC-Asheville for analysis. The FLG was a pioneer in volunteer-based environmental monitoring; it began its program in 1994, when only a handful of such programs existed nationwide. It also organizes and promotes several social events each season, along with regular member breakfasts to keep residents of Glenville apprised of issues related to water quality and lake ecology, relations with Duke Power and community social events. FLG’s single largest event each year is its 4th-of-July fireworks, a point of pride for Glenville lakers. This relatively new tradition started in 1999, when Stuart Hall and some friends created an impressive homespun fireworks show from a barge moored at Buck Knob Island. Ten years later, in response to stricter state laws on fireworks displays, the FLG brought in Jeff Hale, a licensed Pyrotechnics Operator; his group now stages the show from The Point at Glenville Lake subdivision. People stake their claims early for a good spot to watch the fireworks, which can be viewed from the shore by Hattler Realty’s new location. But an even larger audience enjoys the fireworks from the water, on their own boats or those of friends. Boaters dress up in patriotic finery and festoon their watercraft, too—some quite elaborately. Many of those on the water inevitably set off their own fireworks, with the end effect being a southern-style pyrotechnic extravaganza coming from every direction. Whether you visit on the Fourth, at the peak of Fall Foliage season, or during the Christmas Tree harvest, you’ll find that Lake Glenville is full of beauty, surprisingly charming--still rustic and not overdeveloped-- and lots of fun. It may just be the best-kept secret in the southern Blue Ridge.